In the manufacturing industry and beyond, businesses are continuously trying to do more with less. Whether an organization has a dedicated parts storeroom or not, maintenance technicians are becoming more responsible for managing inventory on their own. Without the fundamental knowledge and support to develop and maintain an effective maintenance, repair and operations (MRO) inventory, the result can be lost maintenance productivity, increased downtime and inventory purchasing spend. 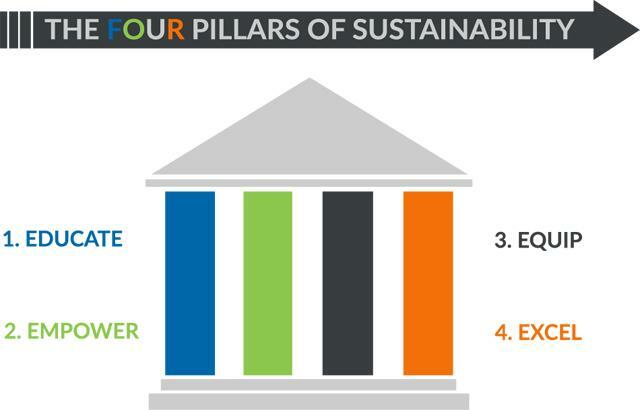 The key to avoiding these negative results is to develop a high-performance work team through the "four pillars of sustainability." In a recent webinar on sustaining effective inventory processes, Dan Floen shared the critical success factors to foster the notion of high-performance work teams and maintain MRO inventory regardless of budget or business environment. The first pillar to sustain MRO inventory is to educate your maintenance team on what success looks like for your organization. Extend that vision to create a clear picture of best-in-class inventory processes that your organization can begin embracing. Define and clearly identify what success looks like in ways that can be quantified, such as 98 percent inventory accuracy, 100 percent process performance and less than 3 percent downtime. These visions of success include improvements in key performance indicators (KPIs) for their respective organizations, e.g., 99.8 percent productivity rate for technicians, 75 percent reduction in monthly cycle count time or 1 percent downtime reduction for an annual savings of $560,000. An important part of inventory education is conducting team training. Training on inventory process topics such as housekeeping and cycle counting will help enforce standard operating procedures. In the same way it is important to identify success for your organization overall. Defining the role each member of your team plays in facilitating that success is critical to gain 100 percent team enrollment. Once an organization educates its team, the next pillar is empowering and establishing team ownership of MRO inventory. Management should encourage and promote innovative inventory ideas, assign responsibility, celebrate successes, and involve team members in the design and setup of the storeroom. By allowing the maintenance team to actively participate in setting up the storeroom, you can foster the notion of a self-directed work team. Members of a high-performance work team value the success of the team over their own personal gain. Equip your team for success by installing a world-class physical environment. This includes building rich inventory data, applying cutting-edge tools (when appropriate) and enlisting trustworthy partners. The physical setup of a storeroom can have a major impact on the success of MRO inventory optimization. Well-kept spaces demand more respect. Taking the extra time to ensure a storeroom is well-lit, organized and streamlined can make all the difference. When every spare part has its own labeled place and there are no parts haphazardly mixed in undefined bins, mechanics will want to sustain this environment. High-quality inventory data is just as important as a world-class physical environment. This data is the basis for efficient item look-ups and the item-labeling process. Consider using a "noun, modifier, rank attribute" taxonomy to build standardized item descriptions. Other key fields include manufacturer name and item number. These help to accurately source and replenish inventory items from suppliers for price quotes. Another important benefit of utilizing this information within an organization's MRO inventory is the ability to make data-driven decisions. A variety of tools are available to help maintenance teams manage inventory as easily and effectively as possible. Implementing and fully utilizing a computerized maintenance management system (CMMS) offers an opportunity to help facilitate success for any maintenance team. A CMMS is designed to help schedule, plan, manage and track maintenance activities as well as manage their associated parts inventory. These systems can also help organizations streamline work, increase efficiency and improve productivity. In addition, it can be beneficial for organizations to make use of handheld technology and to install control-access devices. Also, consider using other technologies such as radio-frequency identification (RFID) or automated retrieval systems. These tools are considered a reasonable investment when you factor in improved team productivity and downtime. Establishing trusted vendor, supplier and contractor partners can help you maintain MRO inventory improvements. Many companies purchase supplies from upward of 100 vendors or more. Spreading your purchases across so many vendors weakens your buying power and leverage. By reducing suppliers, organizations have experienced significant price reductions across the board as well as leverage to motivate key suppliers to work together to develop a total inventory management solution. Partnerships can also extend beyond suppliers. Organizations can partner with subject-matter experts for implementation support, process development or overall training on inventory management. Once you lay the groundwork of educating, empowering and equipping your team, developing effective standard operating procedures and measuring results will help you excel in inventory management. To measure results, establish meaningful KPIs such as user adoption, inventory accuracy, stock-outs and downtime. It is also important within the "Excel" pillar to measure these results and celebrate the successes within these metrics. Post results for all to see and recognize the team and individual members in a significant, meaningful way. Building a high-performance work team is the best way to sustain MRO inventory environments. This process takes upfront effort, but the power the team will generate will affect ongoing improvements within an organization's MRO operation. Greg Perry has 13 years of experience providing leadership in maintenance and operational best practices. Perry is dedicated to establishing positive relationships with clients while bringing a broad base of experiences in maintenance, MRO and operations to the table. In addition to serving as a project manager and delivering implementation services to clients, he has presented sessions at user and training events for eMaint and industry conferences across the country.